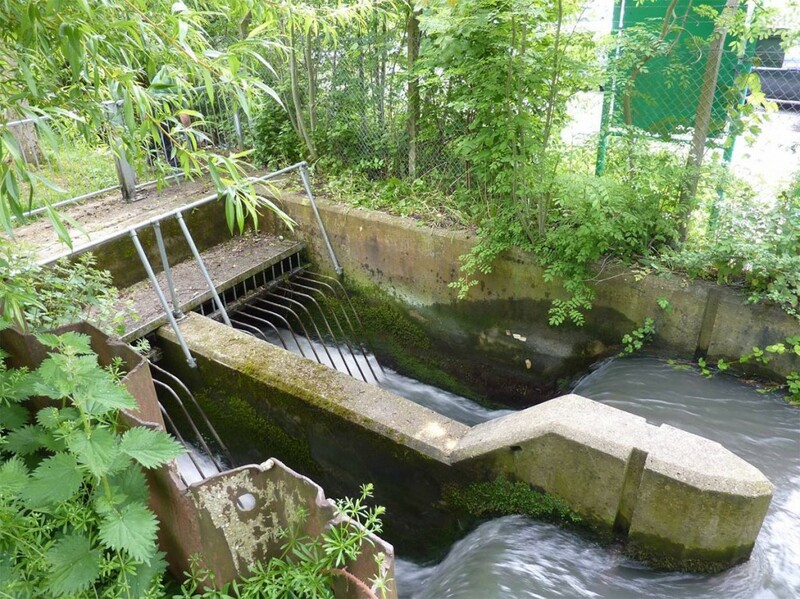 Ever since the High Wycombe Society came into existence in 1967, one of our objectives has been to give the town back its river. The River Wye is steeped in history – it is why the town was here in the first place and it gave the town its mills, at first for grinding corn and then for fulling and papermaking. But in 1966 when “slum clearance” was the watchword and the 1963 Buchanan Report Traffic in Towns had fantasised about beautiful flyovers, it was unceremoniously put underground. Currently, our River Wye disappears into culvert near the junction with Brook Street and then flows along under the Oxford Road. Then at the roundabout it turns right under the now-doomed Abbey Way flyover before finally turning left and emerging beside the Fire Station and the Swan Theatre. In other towns, such as Bedford, or Reading, or even little Calne in Wiltshire, the river is incorporated into the town as an environmental and historical asset. But our river, a rare Chilterns chalk stream at that, is ignominiously buried! Progressively over the past 20 years, in response to the Society’s campaigning, as each new development has come along, Wycombe District Council has been insisting on the River Wye as an asset, not a drain: try crossing The Rye to Bowden Lane and then to the sewage works development (now called Wycombe Dene), on to the Wycombe Marsh Retail Park, and then beyond to Glory Mill, and you see the results, all of them hunting grounds for those lovely grey wagtails! Soon you will see a new stretch opened up for public access upstream in Grafton Street. Now it is the turn of the big one – the town centre itself. If the River Wye is to be deculverted through the town centre, then the ugly Abbey Way flyover must come down, but that could be a great improvement in itself, because it currently cuts off historic High Wycombe from the new development to the west – Eden and then beyond to LIDL and Desborough Road. 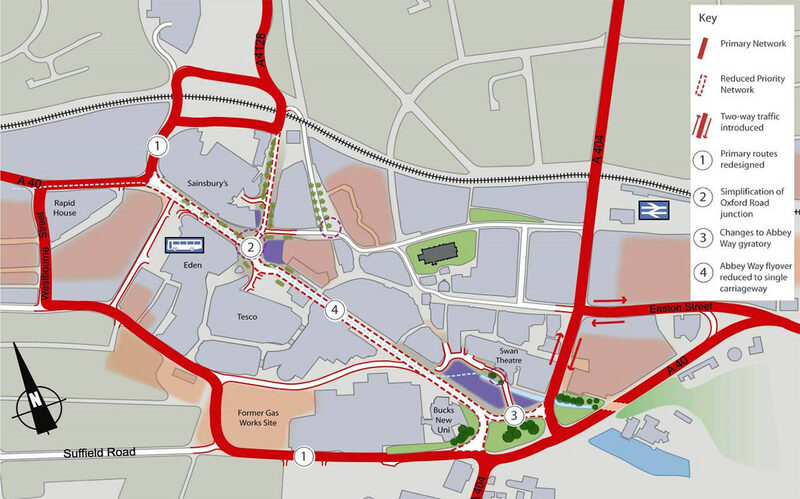 The Town Centre Masterplan was issued as part of the draft Wycombe District Core Strategy but was rejected by the inspector in May 2008 who considered the Council had provided insufficient evidence of its feasibility. Eventually further traffic assessment work was done and the proposals were included in the draft Site Allocations Document which came before an Inspector in December 2012. At the Inquiry, we pleaded with the Inspector to accept it in the SAD. We considered it crucial to the town’s sense of pride in its history that the River should eventually be deculverted, and we were rewarded when the Inspector’s report, issued in June 2013, accepted the proposal. See map MM24 from the DSAD. The first stage is to build the Alternative Route, which will pass along Suffield Road, follow a new link across the Gas Works site, and then along Desborough Road to Westbourne Street, where a new vehicular link will be built to give access to West Wycombe Road. This will operate in parallel with the existing Abbey Way flyover which is currently operating at part width due to assessed structural weaknesses. The County and District Councils consulted on the details of this new route in September 2013 and construction will begin imminently. Assuming that the new route operates satisfactorily in practice, we hope that the flyover can be removed in 2026. That will be almost 60 years since the High Wycombe Society was formed and began its campaign to open up of the River Wye. Progress can take a long time but it is the role of civic societies such as ours to think and work for future generations.